By LUDWIG VON KOOPA - With Mario's help, the CIA is exporting compromised cars to the Mushroom Kingdom. A MAR10 Day exclusive! Even if the mainstream media is scared of discussing it, I hope you've become aware of and familiarised yourself with the “Vault 7” information provided by Wikileaks earlier this week. That's Part 1 of the information dump about how the United States of America's Central Intelligence Agency (CIA) is doing all kinds of nefarious and illegal spying and hacking activities, most of which are outside the scope of KoopaTV. One of the many scary things that the CIA is plotting is to gain the ability to remotely control vehicle systems, and other Internet of Things devices. It's unknown what the CIA would plan to do once they have access to those systems, but many speculate the obvious thing to do is to send someone to their death by taking the car over. Conspiracy theorists (and I don't mean that pejoratively, because they were correct not to trust the CIA to begin with — though that particular video isn't one worth watching) believe that CIA-hacked remote-access to vehicles is how journalist Michael Hastings was killed in 2013. Michael Hastings was a journalist who was on the trail of the American intelligence agencies and was going to release a big story. Then he died in a Mercedes car that all of a sudden went very high-speed and smashed into a palm tree. His death was ruled... an accident. Nevermind that the CIA was discussing developing the capability to do that in 2014, and Michael Hastings died in 2013. That's a minor and insignificant detail. Perhaps the CIA members weren't aware that they already could do that in a different department. Communication is always an issue in large organisations such as that. But that was years ago, and this is now. I have a startling and slightly-personal report to share with y'all about how the CIA's capabilities have evolved since 2013 (or 2014): They are exporting the compromised cars from Earth to my world, and there are already disastrous and almost-fatal results. It's important to note that Michael Hastings died in a MERCEDES. When have we written about Mercedes before? Now, you should ask: How did the Mercedes brand end up over in Star World when it originated on Earth? If you look at that article, you can clearly see whom the brand ambassador is: Mario. But that shouldn't be a surprise. Of course it's Mario. Who else would it be? You really think that the CIA wasn't going to take advantage of Mario (and his cap) going to Earth and dealing with world leaders? I'm sure they were watching the Closing Ceremonies of the Rio 2016 Olympics just as closely as KoopaTV was. While that witch ultimately failed in her quest (though Rand Paul didn't work out) and a president that wants to undo almost everything the previous president did is now in office, it doesn't change the fact that elements within the United States government, the so-called DEEP STATE, are still working on their previous plots. Consider it organisational inertia. Such plots include all of the bad stuff they're planning in my world. Waluigi is driving a Mercedes... and has lost control over it! It's going by itself! Here is a case study in evil CIA plots. This one just happened. Enter Waluigi. He's admittedly a pretty suspicious guy, said to be a UKIP supporter because of his chosen colour scheme. 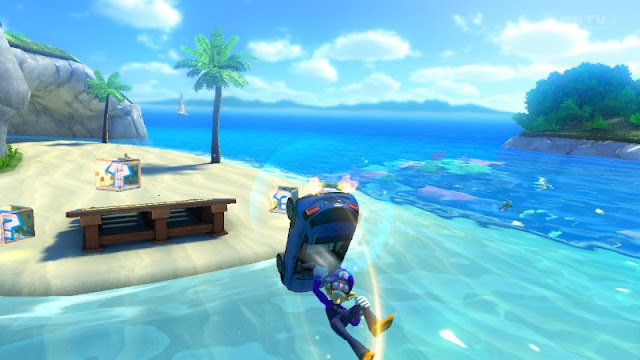 He has a mysterious affinity with water and swimming, which may explain why he is in Cheep Cheep Beach on this occasion. Waluigi always wants the latest and expensive-looking things, and might even be a hipster. Waluigi is also an aficionado of older German culture. As a result, he acquired a Mercedes-Benz vehicle. A GLA, to be specific. Selling price? Absolutely free, which is great because Waluigi doesn't have a job, despite his interest in luxury. He couldn't pass it up. The CIA, of course, knew Waluigi's interests ahead of time. He's a high-profile guy. 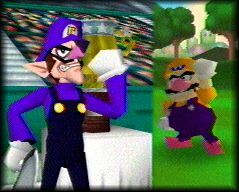 This wasn't an act of randomness: They and Mario conspired together specifically against Waluigi. The CIA believes Waluigi is some sort of terrorist trying to undermine the government, and Mario hates Waluigi as a person due to some... family history. Unfortunately for Waluigi, he had no way of knowing his Mercedes GLA was compromised by the CIA. 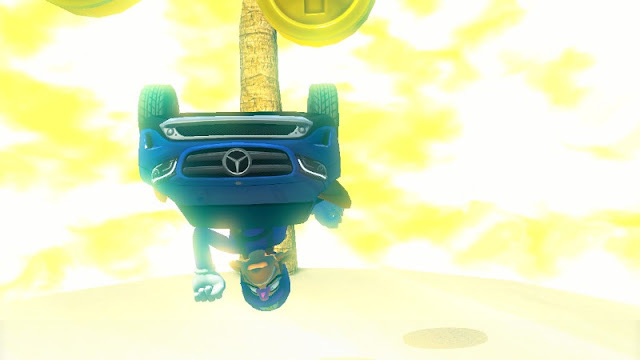 Waluigi's Mercedes crashed into a palm tree, creating a massive explosion. The Mercedes GLA slammed into a Cheep Cheep Beach palm tree, and then exploded. Fortunately, Waluigi survived, but it's truly a miracle that he did. He's in critical care right now. This has CIA fingerprints all over it. I mean, it's basically the same thing that happened to Michael Hastings. Plus, how else would a compromised Mercedes GLA end up in the Mushroom Kingdom if not for the CIA? Don't buy a Mercedes (even if it's free), or any other vehicle with origins from Earth. It's likely a CIA plot, and if it isn't, they're probably still crap. Support Koopa Kingdom's own manufacturing industry! Besides, planes are better than cars anyway. KoopaTV is considering starting a GoFundMe page for Waluigi's medical bills. If you would be interested in donating to him, let KoopaTV know in the comments! (Also, let KoopaTV know if you would be interested in donating to KoopaTV...) KoopaTV and Ludwig have been using MAR10 Day (or “Mario Day”) as a good time to spread the message that Mario is evil for over thirteen years now, and the plumber's acts of cruelty never cease to amaze. During 2016's March 10, KoopaTV reported that competitor Mario Kart TV was ending. For 2015's March 10, Ludwig went on an investigation-turned-rescue-mission to rescue the Moo Moo Meadows cows that were ruthlessly and racially segregated by Mario. In 2014's March 10, Ludwig talked about how he was in Mario Kart 8 and the previous month's Nintendo Direct. 2019's March 10 ties Mario directly to Daylight Savings Time. Good thing my car isn't a Mercedes! ...The CIA can hack ANY car. Not just Mercedes. They just happen to like (or...really hate, since they get wrecked) Mercedes for some reason. I was gonna ask how can they hack a 2000 car model, but they're the CIA. I'm not sure at what year cars went from being physics-based to computer-based. Whatever is after that year the CIA can hack. This is one of the most interesting conspiracies that I have heard in a while. I never came to the conclusion that Waluigi was such a high ranking individual, but now that you mention it, that explains everything. I can see why the CIA was after him. For all we know, they may be attempting to hack King Bowser's Koopa Clown Car next. I know. It's scary. How am I gonna participate in Super Smash Bros. now? Fortunately, the whole point here is that, for now, we only need to be afraid of vehicles that come from Earth. The CIA, as of now, doesn't have any capabilities to send agents to compromise our fleets over here. The key thing is that the CIA needs to plant some sort of bug or backdoor into a product first, before they can remote-access and hack it. 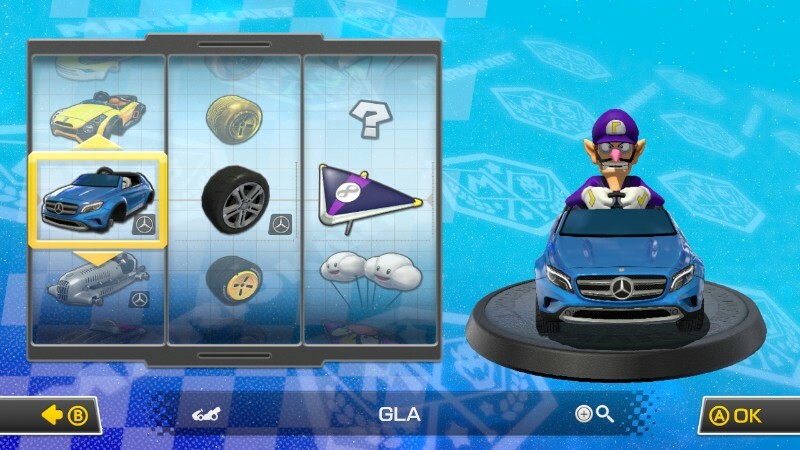 Since Waluigi saw a FREE MERCEDES, he's like, "WAAAAH!" and took it. That sealed his fate. I share two old cars, both over at least five years old, and both reaching the 200,000 mileage. I'm actually glad they aren't computer-based models. The only technilogical-related piece of hardware are the GPSes that are only connected to the car by power source. I don't think I'd be able to support Waluigi's medical bills. You may have to ask him for his consent. Glad your dad's collaborated with the Wario Bros in Mario Power Tennis, though! If they're both reaching 200,000 mileage then they're definitely quite over five years old! Ask him for his consent to receive donations? C'mon, this is Waluigi. He's not gonna turn down free money. Anatomy of The Wonderful 1237's Minigames! The Nintendo Switch Is The Anti-CIA Console!